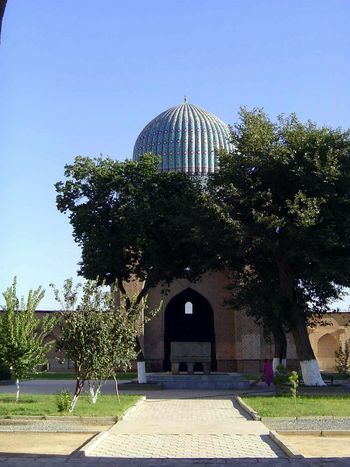 Tamerlane ordered the construction of a grand jami masjid or Friday mosque. 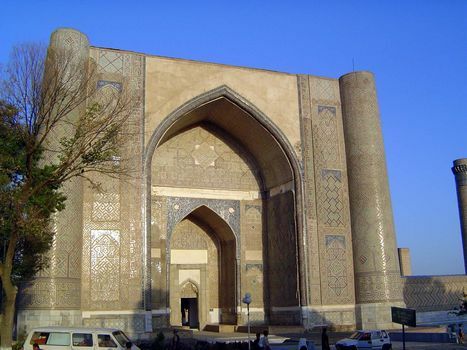 It's named for his favorite wife, a Mongolian princess named Sarai Mulk "Bibi" Khanum. 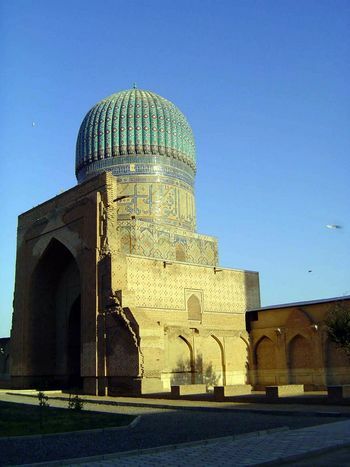 Tamerlane was getting old, however, and he was so impatient that he ordered the building completed at breakneck speed. 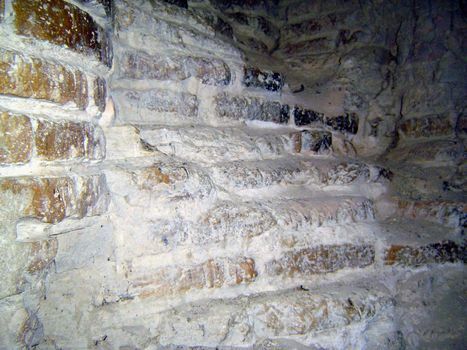 The result is that it began falling apart shortly after its conpletion in 1404. Seen by generations in splendid ruin, it was rebuilt after 1974 by the Soviets, although reduced in size by a third. 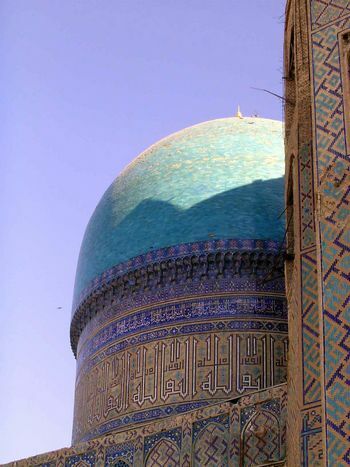 Bibi Khanum consists of two great pishtaqs around a courtyard; behind the one on the right, and hidden from view, is an immense dome. From a different angle: the two portals and the dome behind. A closer view. 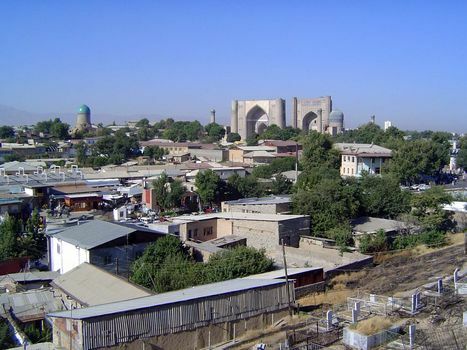 Tamerlane had 150,000 people working on his construction projects in Samarkand in 1404. 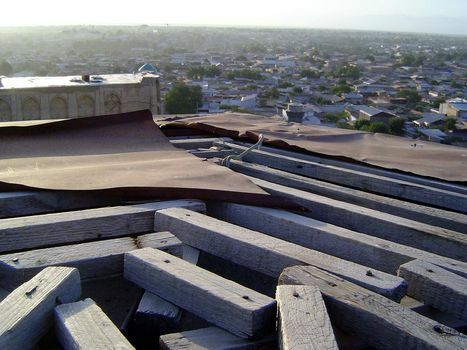 In the Zafarnama of Sharaf ad-Din 'Ali Yazdi, we read: "Five hundred stonemasons from Azerbaijan, Fars, Hindustan, and elsewhere had been summoned to work on this mosque, not to mention the laborers who quarried the stones in the mountains and transported them to the city.... Ninety-five elephants had to be brought from India to Samarkand to roll the huge blocks... The dome would rank supreme were it not for the sky itself; and so would the arch of the iwan were it not for the Milky Way." 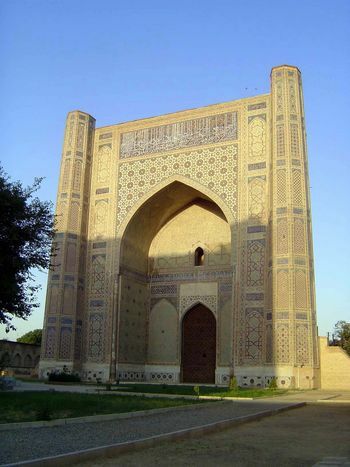 Of Timur's involvement, Sharaf continues: "He would arrange for much meat to be cooked and brought, and then he would order them to throw portions of the same down to the workmen in the foundations, as though one should cast bones to dogs in a pit, and a wonder to all he even with his own hands did this." The dome, reduced from the original. 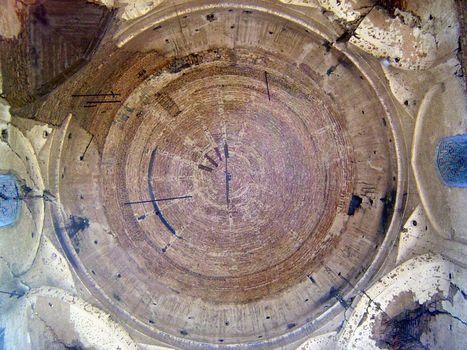 Interior of the dome, left in the rough when rebuilt by the Soviets. 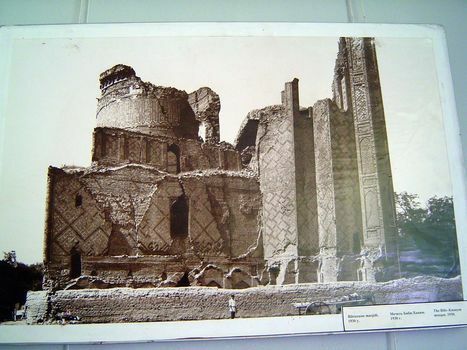 This photograph shows the severely decayed mosque before the earthquake of 1897, which brought the dome down completely. One of two side domes on the other sides of the quadrangle. 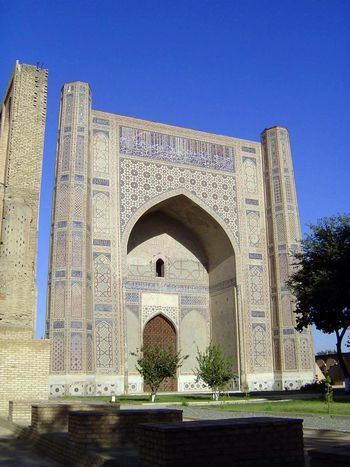 In the shade straight ahead sits a massive marble lectern that once held the same Omar Qur'an that's now in Tashkent. The lectern was inside the prayer hall until moved here by the Soviets, who feared that the building would collapse on top of it. 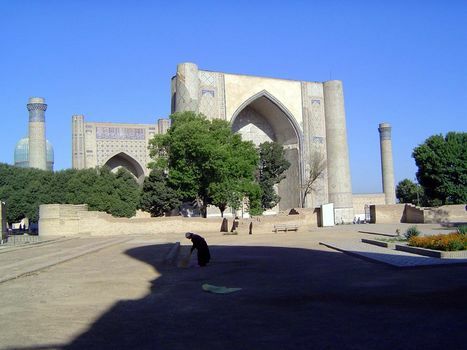 Originally, the mosque had massive colonnades all around; they've been omitted from the reconstruction. Crude steps lead up the great minarets attached to the pishtaq. At the top: rough new finishing. 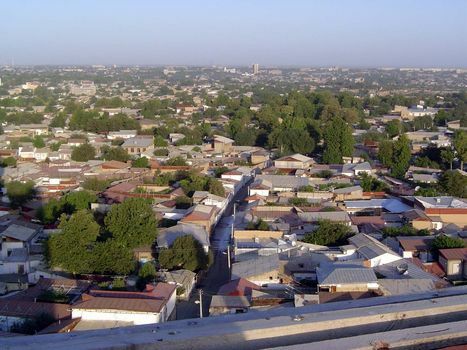 The view here is of the residential neighborhood to the east. 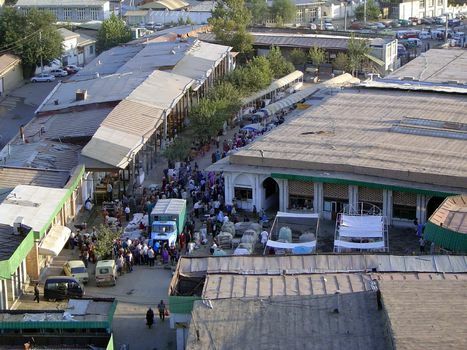 Here: toward a busy market.